Few other place names in the Bay Area are as well-known as San Quentin, and the peninsula bearing this name has, since the settlement of Marin County, seen more than its share of land-use disputes, political scrabbles, and headlines. 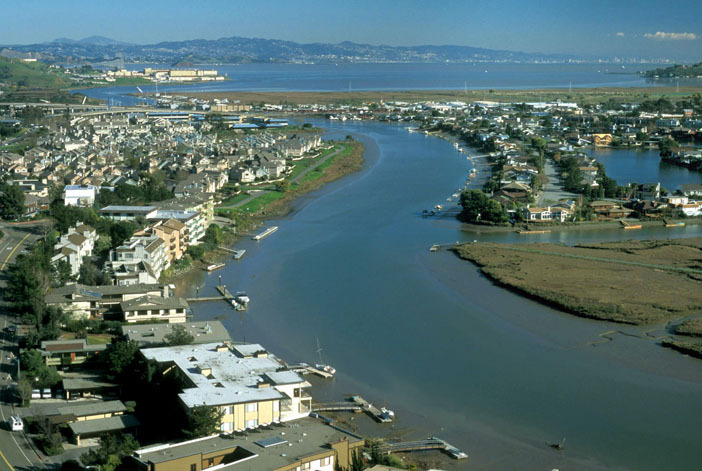 The peninsula’s south side, up to the state prison, is the northeastern-most point of the Corte Madera Creek watershed. This area is largely within Larkspur city limits, with the prison and San Quentin Village in county jurisdiction. The peninsula north of the ridge is in San Rafael. Coast Miwok inhabited the peninsula prior to European settlement and the name derives from a Miwok baptized Quintino who rebelled against Mexican rule. The peninsula and much of the lower Ross Valley comprised a land grant known as Rancho Punta de Quintín which in the 1840s was deeded by Governor Juan Alvarado to one Captain Cooper to liquidate a debt. In the hurly burly Bay area of the mid19th century, land and politics were closely commingled, and in 1852 one owner of the land grant sold 20 acres to the State of California for $10,000, the site that would become a prison. The village of San Quentin grew up at its main gate. 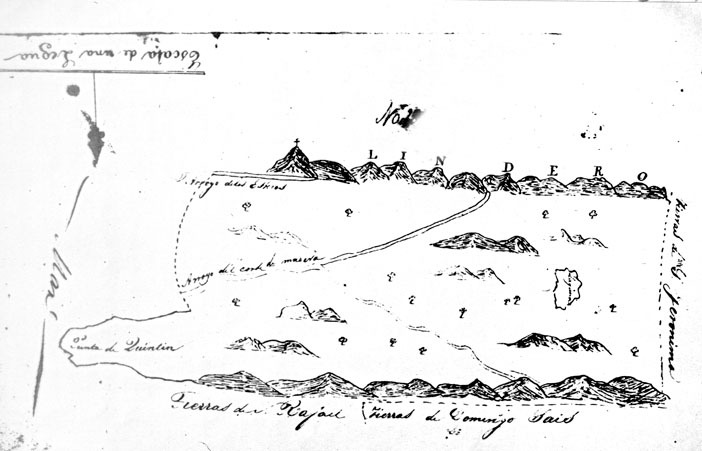 A sketch defined the 9,000acre grant made to Juan Cooper in 1840. San Quentin peninsula juts into the Bay at bottom left; Mount Tamalpais is the southern boundary or “Lindero” at the top; Corte Madera Creek crosses at a diagonal in the center. In the 1840s two sawmills constructed at the mouth of what became Baltimore Canyon in Larkspur provided lumber for booming San Francisco. Mill employees stripped southern Marin’s hills of redwoods, milled the lumber which was then hauled to Ross Landing (near the current location of College Avenue in Kentfield). There it was loaded onto barges, and floated down Corte Madera Creek to the bay; from there it went to construction sites around the Bay. The steamship Ida carried passengers between Corte Madera Creek and San Francisco three times weekly in 1860. The mills operated for about 10 years, shutting down when they ran out of timber. The peninsula continued as an industrial center into the 20th century. The Remillard Brick Company, operating from 1891 to 1915, produced some ten million bricks, sold all along the coast. The Hutchinson Quarry, mining the Franciscan “blue rock” began operation in 1924 and its products were barged around the Bay until the late 1950s. Largely due to the presence of the state prison, the peninsula has played a part in almost 20 Hollywood movies, including Humphrey Bogart’s Dark Passage and Clint Eastwood’s Dirty Harry–the movie series. Dirty Harry’s many chase scenes included one through the old Hutchinson Quarry and a daredevil ride in a 1968 Ford Custom 500 along Sir Francis Drake Blvd, featuring views overlooking Francisco Bay. Environmental reports prepared for subsequent land-use projects on the peninsula have further identified wave and tidal bank erosion, Miwok burial remains, shallow groundwater under the prison, visual impacts, and increased vehicular traffic as considerations in land use planning. Potential constraints have not discouraged development. From the mid-20th century, there has been a building boom on the peninsula, including Larkspur Landing (now Marin Country Mart), reuse of the brick kiln for a succession of restaurants, the office complex atop oak-covered Wood Island, retail uses in the flat area known as Buckelew Flats next to Wood Island, Drakes Way housing, Lincoln Properties’ 478-apartment complex, Larkspur Courts Apartments on Old Quarry Road, and the ferry terminal, built in the mid-70s across from the main peninsula. Miwok Park, an eight-acre open space on the hill above the former brick company remains a nostalgic remnant of earlier times. The park was set aside as a condition of approval for Lincoln Properties’ development. Its major feature is the freshwater Tubb Lake, a small manmade lake that was impounded by an earthen dam to provide water for brickmaking. With the closing of the brick company, the lake in the 1920s became a popular swimming hole for local teenagers. It was the site of a pottery studio in the 1960s, and now provides habitat for a variety of bird species. It is also a popular hiking destination. The kiln is in the National Register of Historic Places. Remillard Park, across Sir Francis Drake Blvd from the kiln and former Ross Valley Sanitary District property, has a multi-use path paralleling Sir Francis Drake Blvd, with benches and a freshwater marsh that is home for western pond turtles, and migratory and resident birds. The 30-foot statue of Sir Francis Drake at this location was donated by sculptor Dennis Patton in 1988. There have been periodic moves to close or downsize San Quentin State Prison to free the property for other uses. Two of the most spectacular were in 1971 and in 2001-2005. The top headline across the front page of the January 7, 1972, San Francisco Chronicle read, “Quentin to Close by 1974—Reagan Tells Other Plans.” The chairman of the Marin County Board of Supervisors, learning the news on his drive in to work that day, said “I’m delighted,” and opined his hope that the property be turned over to the University of California at Berkeley. Other interests intervened, and the prison stayed open. Other forces again intervened and the prison remains. The Marin Countywide Plan now simply states “San Quentin is expected to remain a state prison for the duration of this Countywide Plan and is therefore designated as Public Facilities, reflecting its current use. No other designation or policy is established by this plan. However, should non-prison uses become feasible in the future, consideration could be given to development that is less than or equal to the energy and resource consumption and traffic-generation of the current prison use. Bicycle travel soon begins on the Richardson Bay Bridge, and within a couple of years the Sonoma-Marin commuter train will travel daily to Larkspur Landing. So the peninsula is not through making headlines.